Withings has joined Apple in bringing serious heart rate monitoring to the wrist with its new Move ECG smartwatch. Unlike the Watch Series 4, the Move ECG is a hybrid smartwatch as opposed to a full fat one like Apple's, so it retains the look of a traditional analog watch while adding those smarts in more subtle ways. The headline feature is the introduction of an electrocardiogram, which means the Move ECG is capable of detecting conditions such as atrial fibrillation (Afib). It does this via three electrodes, two of them discreetly integrated inside the main body of the watch. The third lies inside of the watch’s stainless steel bezel. Touching both sides of the bezel takes an ECG measurement and takes no longer than 30 seconds, says Withings. The watch will vibrate to notify the user a reading is taken and then is synced to the Withings Health Mate app. From here you’ll be able to see if the heart is beating in a normal pattern and find additional heart data that can be shared with a doctor or healthcare professional. Unlike the Apple's ECG feature though, Withings does not have FDA or CE clearance (yet) but it is currently under review. Away from its new serious health monitoring skills, the Move ECG brings the usual array of activity tracking skills we’ve come accustomed to find on Withings’ watches, plus a few new extras. It’ll track steps and display progress on the sub dial of the watch. There’s automatic exercise recognition for the likes of swimming, cycling (that's new) and running. For the first time on a Withings watch, you can also track elevation. The watch offers connected GPS, so you can piggyback of your phone’s GPS to map outdoor activities (but can't use it standalone) and you’ll get to benefit from all of the latest Withings sleep monitoring features. The Move ECG is water resistant up to 50 metres and promises to deliver battery life for a year before the battery needs to be replaced. It’s going to be available in the first half of 2019 priced at $129.95 and will be available in white and black watch face options. If you’re not too fussed about taking ECG readings from your wrist, Withings has also unveiled the Move, an activity tracking hybrid that only costs $69.95. The Move is a 38mm hybrid that features that now-signature sub dial to display your activity tracking progress. Like the Move ECG, it’ll automatically recognise a host of activities including walking, running, swimming and cycling. Connected GPS support means you can press the button on the watch to piggyback off your phone’s GPS and get additional metrics. Sleep monitoring is included too with support for smart alarms along with access to sleep score data and Withings’ Sleep Smarter Program to help improve sleep patterns. Like the Move ECG it has a water resistance of up to 50 metres and will muster up up to 18 months of battery life. 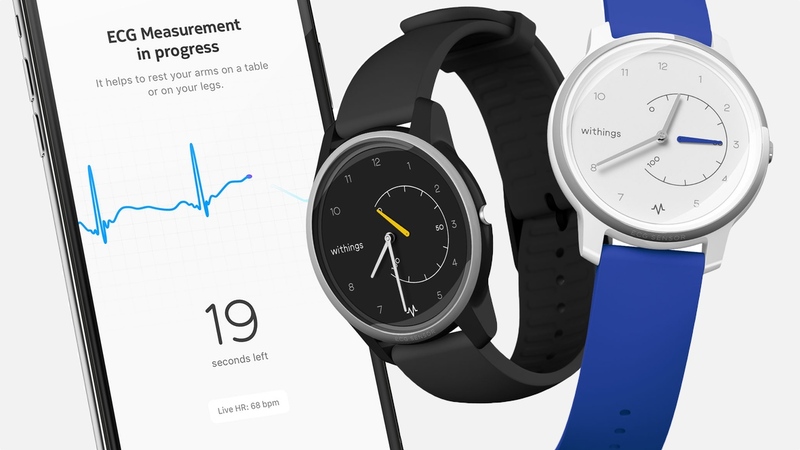 The iOS and Android-friendly Move will launch in five different colours, but Withings plans to add new design every month and will offer different colours, cases, glass type and wristband materials. It’s available to pre-order now. We'll be at CES to get our hands on the two new Withings hybrids to see how some of those new features are shaping up.